A $10,000 reward is being offered for information in the case of a dog found severely injured early Thursday morning in San Francisco's South of Market neighborhood, according to the Animal Care and Control. The 1- to 2-year-old male pit bull terrier mix with brown and white fur, who shelter staff have named Maximilian, was found at about 6 a.m. Thursday below the U.S. Highway 101 overpass near South Van Ness Avenue suffering from serious injuries, according to the city's Department of Animal Care and Control. 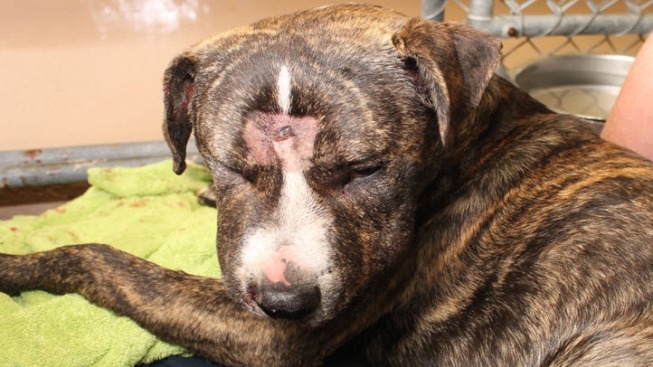 The dog's injuries included blunt force trauma to his head and body, broken and missing teeth, severely injured paws with missing pads and nails and burns from heat sources including cigarettes. Animal Care and Control is now offering a $10,000 reward for information leading to the arrest and conviction of whoever is responsible for Maximilian's abuse. Donations are being accepted to assist with Maximilian's medical bills and can be made to the Friends of Animal Care and Control's Special Medical Fund at www.helpacc.org. This fund assists animals that have medical needs beyond what Animal Care and Control typically treats. Virginia Donohue, Animal Care and Control's executive director, said that while animal shelter employees are doing all they can for Maximilian, they "need the public's help to find the person who abused him so we can hold him or her accountable and make sure another animal does not suffer." Anyone with information that could help investigators is encouraged to call Animal Care and Control at 415-554-9400. Callers may remain anonymous.